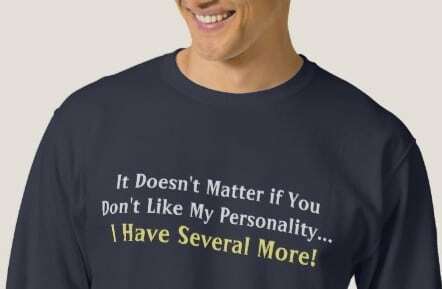 It doesn’t matter if you don’t like my personality… I have several more! Humorous and funny saying / quote. Comes in White text/ font and/or in Black text/font. These Funny Personality Shirts are from our Silly One Liner Category! Fully customizable. Choose a dark or light shirt. Available on T-Shirts, Active-wear, Tank Tops, Hoodies, Maternity, Dresses, Jerseys, Sweatshirts, Polos and more. Available for Men,Women and Children. Shopping for t-shirts is fun and easy with Zazzle. You want it, chances are we have it! Browse our amazing selection of t-shirts designs and find one that fits your personality or create your own t-shirt. Our shirts come in many different sizes, styles, and colors to offer you enough combinations to satisfy your needs. Shop for yourself or purchase some t-shirts as gifts for friends and family.